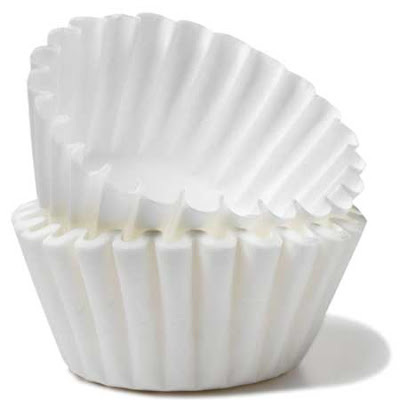 In recovering from yet another road trip, this time back to St. Louis to watch my Cardinals knock the Padres back to their cloisters, I find it practical to share these practical applications of the common Coffee Filter. Being practical is part of Thinking! Having coffee is part of Drinking! Saving money is part of Being Merry! I would like to thank Sir Richard who sent this email to me while on the road. 1. Coffee filters make excellent covers. Cover bowls and dishes when cooking in the microwave. 13. Put a few in a plate and put your fried bacon, French fries, chicken fingers, etc. on them. They soak out all the grease. I'm heading down to the Dollar Store, or if I was back in England a Poundland, to buy some today. Good, practical tips. My favorite kind. #16 Cheap alternative to Depends. What? You're supposed to put something in that coffee maker basket before putting in the coffee? Damn, all these years chewing my coffee!!! Tough to top that -- pardon the pun.